The strengthening U.S. dollar has lately put a dent in the price of gold, and rising interest rates are [currently] making some yield-bearing financial assets more attractive as a safe haven but, as the Liechtenstein-based investment firm Incrementum shows in its… 2018 edition of…”In Gold We Trust”, there are many risks right now that favor owning gold in your portfolio. This version of the original article, by Frank Holmes, has been edited* here by munKNEE.com for length (…) and clarity ([ ]) to provide a fast & easy read. Visit our Facebook page for all the latest – and best – financial articles! Below I’ve selected 5 of the most compelling charts that highlight why I think you need gold in your portfolio now. To offset the effects of the global financial crisis a decade ago, central banks increased liquidity by slashing interest rates and buying trillions of dollars’ worth of government securities. Now, however, it looks as though banks are ready to start tightening, and no one is really quite sure what the consequences will be. The Federal Reserve was the first, in late 2015, to begin hiking rates, and it’s been steadily shrinking its balance sheet for about a year now. Other banks are set to follow suit. 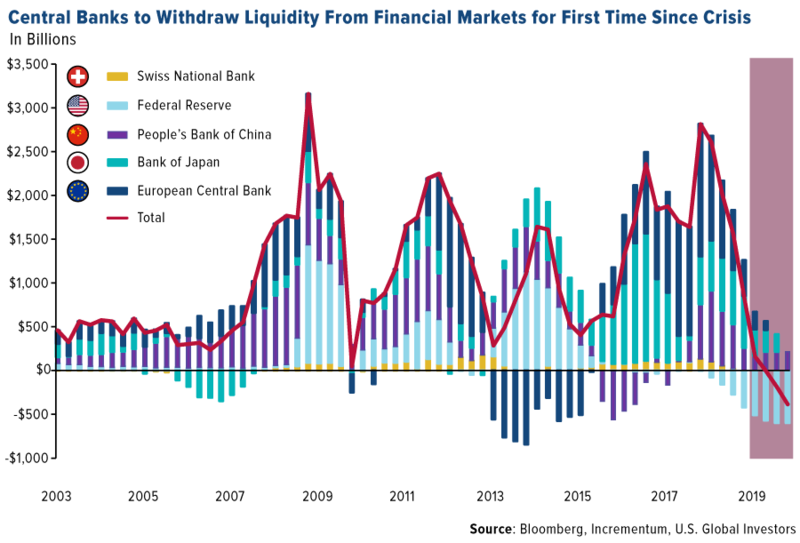 According to Incrementum, the tide will turn sometime next year, with global liquidity finally set to turn negative. In the past, recessions and bear markets were preceded by central bank tightening cycles, so it might be a good idea to consider adding gold and gold stocks, which have historically done well in times of economic and financial turmoil. While I’m on this subject, central banks have been net purchasers of gold since 2010, with China, Russia, Turkey and India responsible for much of the activity. Just this week, I shared with you the news that Poland added as much as 9 metric tons to its reserves this past summer. If gold is such a “barbarous relic,” why are they doing this? 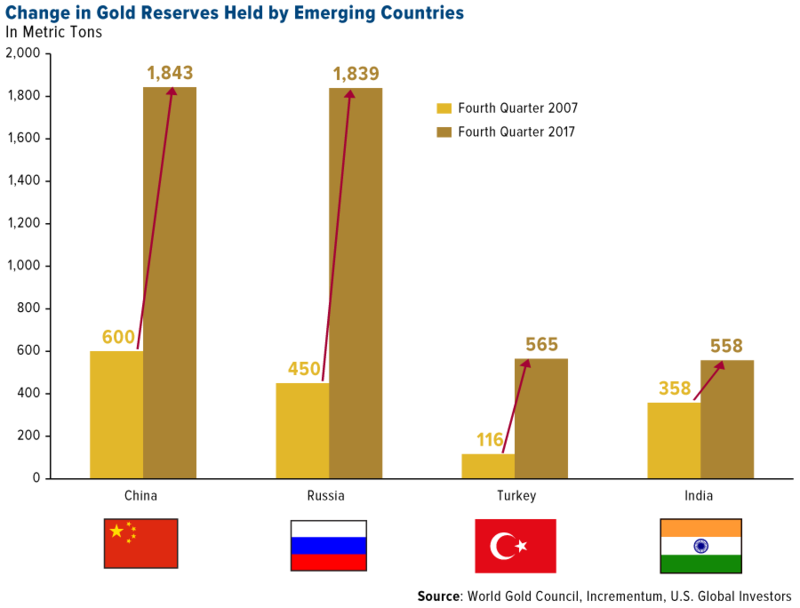 As Incrementum writes, “The increase in gold reserves should be seen as strong evidence of growing distrust in the dominance of the U.S. dollar and the global monetary system associated with it.” Having a 10% weighting in gold and gold stocks could likewise help you diversify away from fiat currencies and monetary policy. Everywhere you look, debt is rising to historic highs, whether it’s emerging market debt, student loan debt or U.S. government debt. Meanwhile, higher rates are making it more expensive to service all this debt. 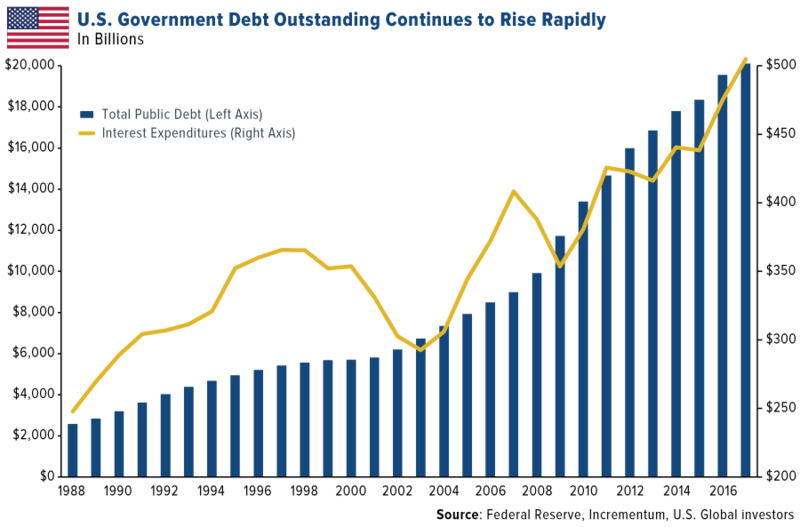 As you can see below, interest payments will hit a record $500 billion this year. It’s forecast that the federal deficit will not only reach but exceed $1 trillion in 2019. How will this end? Earlier this year, I called this risk the “global ticking debt bomb,” and I still believe it’s one of the most compelling reasons to maintain some exposure to gold. 5. A Sterling Time to Buy Gold? Finally, a word about timing. 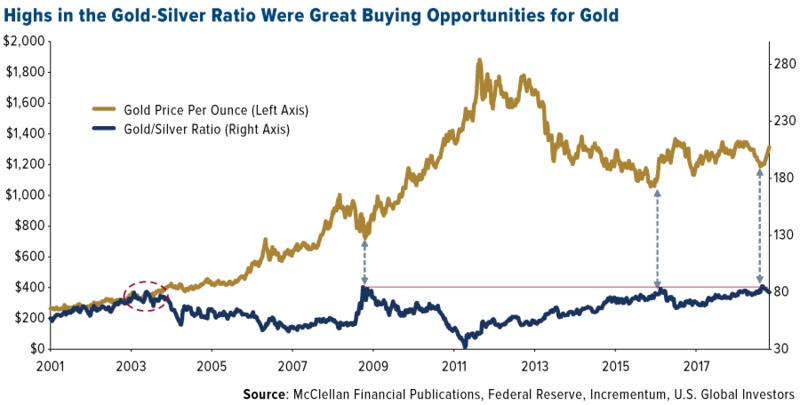 According to Incrementum, some of the best gold buying opportunities have been when the gold/silver ratio crossed above 80—that is, when it took 80 or more ounces of silver to buy one ounce of gold. If you look at the chart below, you’ll see that such instances occurred in 2003, 2009 and late 2015/early 2016—all ideal times to accumulate. We see a similar buying opportunity today, with the gold/silver ratio at a high of 83 as of October 8. What’s more, gold stocks are the cheapest they’ve been in more than 20 years relative to the S&P 500 Index. Previous How Does Your Savings Account Compare With the Average American’s? How About the Top 1%’s?